I am hoping all of that rain from last week is done for a while! Kudos to those of you who braved the weather last Tuesday. In case you missed it, Jane announced the destination for this year’s half marathon – Nice, France on 24 April 2016! Please let us know if you did NOT receive Jane’s email. Do not worry if you can’t even think about running a half marathon at this point. Right now, just getting out there twice a week with the group is all that should be on your mind. There will be more information forthcoming about the trip and we will have a beginner information session sometime in October to talk about it and answer all of your questions. So stay tuned! We have a new beginner joining our group this week and she plans to meet you all on Tuesday. Her name is Faridah so please be on the look out for her. This week’s run time will be just a slight increase from last week’s. We are taking our time building up to make sure your bodies are becoming adjusted at a nice slow pace. As always, please let one of us know if you are hurting or struggling. We are so glad so many of you were able to run together on Tuesday. It’s great to start to set that routine early on. This week we will be adding one 3 minute interval running interval to our two minute ones. It is absolutely essential we keep the pace very very slow so we don’t allow our heart rates to get too high, both for psychological reasons (so you don’t feel exhausted and worn out when you finish, and start hating it) and for physiological ones (as most of you haven’t run before, you need to give your bodies time to adjust so as to keep injuries at bay). Please let us know if anything is hurting. Most aches and pains can be quite easily addressed early on – it’s continuing to run on an injury that causes bigger problems. And finally, if you are on this email list and have decided to not join our group, please let me know and we will take you off the distribution. Otherwise, it is certainly not too late to join us! We are off to a great start! We are so excited to get to know you – we clearly have a fabulous group this year. This is a long email with lots of information so please bear with us. We have attached our program as a two page PDF. One is the specific running/walking intervals week by week. The other is more of broad weekly view of what we are doing. For those of you who are just joining us, don’t worry! You’ll be fine. Our routine is this: on Thursdays the coaches will run with the group. The following Tuesday, the group will meet at Barclays at the same time (always 8:15 am for an 8:20 start) and repeat what we did the prior Thursday. To time your intervals, we find that an app called IntervalTimer works very well. I’m sure there are others out there, but that one is free and fairly easy to set up. It generally works best if someone is the official timer person each Tuesday and someone else guides the group. We will be running in Regent’s Park for the first few weeks so it’s not too tricky to guide. We are happy to help you all manage it – just ask! For anyone who was not able to join us on Thursday, just show up on Tuesday, introduce yourself, and you will be fine. Also, if you find you cannot make a Tuesday or Thursday run, try emailing to group to see if there are others who might be able to join you later or on a different day. I know a few people asked whether we run through the winter and in the rain. The short answer – yes! The only time we cancel runs would be for icy conditions which are dangerous. Otherwise, we run in rain, sleet, snow, hail, etc. That being said, you might consider buying a good running rain-jacket. It needs to be lightweight and breathable. Runners Need sells them as do most of the outdoor shops, or ask any of the coaches for recommendations. You might be surprised that we don’t usually have to run in rain. We like to joke that the sky clears for WRW – it will be raining as you walk to Barclays and by the time we start running, it’s over. And if it does rain, it passes over quickly. It’s rare we run in heavy rain. If you’re in the market for new shoes, we recommend waiting a month or so. Often, as you start running each person develops a gait and it actually improves (or becomes more efficient) over time. If you go in now for shoes, they may fit you in shoes that are appropriate for your current gait. That gait may very well change in the next few weeks so hold off if you can make yourself wait! OK – the last few things. First, our running group has a website: www.womenrunningtheworld.com. We will post this email under “Beginners” so if you misplace it and are looking for information, you can find it there. Our program will also be out there as well as some route information if you’re interested. So the website could be helpful but don’t worry about any of the other information posted out there for the Mon/Wed/Fri group. Second, our group has a Facebook page – WRW London. You will need to request to join and we will add you. We look forward to seeing you next Thursday and hearing about how SLOW you ran on Tuesday! 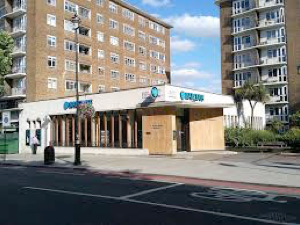 As you probably know, the beginner running group starts this Thursday, 10 September at 8:15 am at Barclays Bank in St John’s Wood at the corner of Circus and Wellington Roads. We are so excited to get going! If you have changed your mind and are no longer interested in learning to run, or believe you may belong in the regular non-beginner group, please let us know. Otherwise, you can expect to receive an email from us each week explaining what we’ll be doing the following week. Lesley Gallagher and Stacey Towfighi will be assisting most weeks and are looking forward to providing support wherever you might need it. Lesley was a beginner 2 years ago and Stacey ran a half marathon with the group way back in 2005! Jane Novak is the overall leader of Women Running the World and will also run with us many weeks because she loves getting to know everyone! 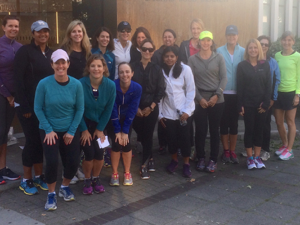 Very important – this group is for women who have never run before. If you can run even a mile or two, you likely belong in the regular running group that meets Mon/Wed/Fri. We need to all be working through this process together – if someone is running circles around us, it’s demoralizing. Plus, it will be boring and frustrating for you. Feel free to talk to any of the coaches about where you belong. The program is gentle, but it’s still difficult. For the first few weeks, we will be out there less than 45 minutes. We will do a 5-10 minute walk to warm up, then we will jog very, very slowly for 60 seconds, then walk for 2 minutes. We will repeat the 1 min jog, 2 min walk pattern 10 times, then finish with a 5-10 minute cool-down walk back to Starbucks. So when we have finished our session we will have jogged for a total of 10 minutes. Over the weeks, the jogging intervals increase gradually but we continue to go at an extremely slow pace. We understand it’s difficult to believe, but by early January you will be running a steady 60 minutes without any walking breaks. By April, you will be fully prepared for a half-marathon (13.1 miles). We have not yet chosen the half marathon location but we expect it will be in mid-late April. More on this to come! Our training schedule will prepare us for the half-marathon, but please know that you do not have to go on the trip or have any intention of running those distances. You do not have to commit to anything! That is the beauty of this group…. you don’t pay to be part of the group and you don’t have to commit to a long-term program. If you try it for a few weeks and don’t like it, you stop. No hard feelings – at least you will have tried. All of that being said, the women who end up most successful with the program are those who make a mental commitment to being there week after week. Each Thursday, we will run with the group, set the pace, tell you when to run/walk and set the route. We will also encourage you to start meeting up one more day a week either as a group or as several small groups (most of the beginner groups in the past have done this on Tuesday mornings but that’s up to you). For the first 8-10 weeks, this second run each week will be a repeat of whatever we did with you on Thursday. Believe me, that second run each week (without us) will teach you just as much as the Thursday run. If you know of other people who want to join us, please encourage them to come and start with us. It is very difficult for people to join the group after a month or two as by then we are running quite a bit, so tell them to come and come now! Particularly keep an eye out for women new to London who might would be interested in joining the group. For many new-comers, by the time they hear about the group, it’s too late (we’ve made too much progress) for them to catch up. We will address injuries/aches/pains as we go. Most problems can be dealt with without having to stop running. We have a list of specialists that we can guide you to. It is much better to see someone quickly than to let something minor turn into something bigger. Come dressed however you choose. There is no need to buy a lot of running clothes at this point and definitely do NOT buy a new pair of running shoes yet. We can tell you where to go in London once you’ve settled into the program. One year a beginner ran in jeans for the first 3 months as she was convinced she wouldn’t become a runner and didn’t need to invest in running clothes. So no worries about how you look, just show up. Be on time. We do not operate on an RSVP system so whoever is there at 8:15 runs. If you’re late, you will be left behind. For any of you dropping off young children or have other complications, just let me know. We’ll try to figure something out. No dogs or strollers allowed (sorry!). Always carry with you a bit of money and an Oyster card (and possibly a Starbucks card). For awhile we won’t be getting very far from SJW, but it’s nice to know you always have the option mid-run to grab a cab/tube/bus if you have a problem. Also most of the women stay for a coffee after the run. This is a great time to ask questions or discuss concerns as sometimes we don’t all get a chance to talk to each other during the run. The program works – we promise. Countless women have come through it successfully. It’s hard, but it’s good fun and the sense of accomplishment you will feel is simply more than we can put down in words. So give it a try, show up on 10 September and see what happens. We know it’s scary – most women are terrified, some don’t sleep the night before the first session, some show up feeling queasy, but don’t worry. We are all in the same situation. We are doing this to learn how to run – it’s impossible to “slow down the group” or “hold people back”. You can do this – we promise. We’ll hold your hand or pick you up and carry you if need be – just show up. That’s all you have to do is show up – we’ll guide you through each step along the way.